Star Wars Celebration is currently taking place in Chicago and it's officially in full swing as director J.J. Abrams and the cast descended upon the city to present us with our first look at Star Wars 9, which we now know to be titled Star Wars: The Rise of Skywalker. The energy in the room was absolutely electric, as fans were particularly eager to learn what little Abrams and Co. were willing to reveal about the final chapter in the Skywalker saga. For those who weren't on hand, I'll do my best to recap the events here. Star Wars Celebration kicked off with a stunning and beautiful featurette recapping the entire saga. It started with some great behind the scenes footage from A New Hope, which was very jokey and lighthearted. Footage and behind the scenes clips from all three trilogies were included. It's been said and heavily suggested that this movie will do its best to unite the entire saga and this featurette spoke to that. It also set the tone just right. People in this room are fans. There wasn't a shred of cynicism to be found. People are here to love Star Wars. They're ready and eager to love this movie. And then they brought out the day's surprise moderator, Stephen Colbert, who is a known and proud nerd. And as he explained during the panel, has been a Star Wars fan for three weeks longer than anyone else, since he won free tickets to an advanced screening back in 1977 from his local radio station. Colbert warmed up the crowd by showcasing his nerd cred and being his usual charming, hilarious self. But fans were here to learn about Episode IX and who better to talk about it than J.J. Abrams and Lucasfilm President Kathleen Kennedy? The two came out on stage and were given a very warm reception from the crowd. Both expressed a tremendous amount of gratitude toward the fans and both made it very clear they understand just how much responsibility comes with bringing this new trilogy to a close. As Abrams explained, the movie needed to stand on its own, while also shouldering the responsibility of bringing this entire nine movie saga to a close. As is always the case, Abrams was very tight-lipped and didn't want to give anything away. Colbert did his damndest to milk details out of him though. At the very least, it made for a fun back and forth between the two. As far as meaty details go, J.J. Abrams did confirm that the movie will feature a time jump, though he wouldn't say just how much. Daisy Ridley did hint later on in the panel that it is a relatively significant one, as she made it clear Rey had time to read some of the old Jedi texts since we last saw her in The Last Jedi. Abrams also talked about the inclusion of Carrie Fisher as Princess Leia in this movie. He was clearly choked up and expressed that he misses her all of the time. Still, she's going to be featured, via unused footage from The Force Awakens and The Last Jedi. 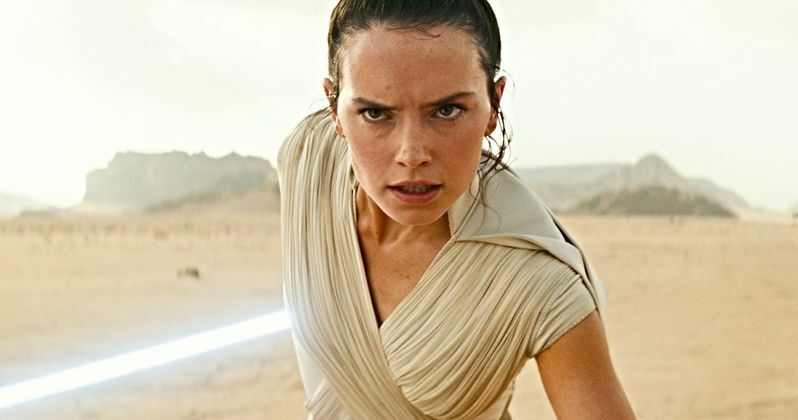 Spoiler: we see her for a shot in the trailer hugging Rey and it's amazing. Abrams (paraphrasing a touch) had this to say. "She was amazing... You don't recast that part and you don't suddenly have her disappear... Every day it hits me that she's not here... but she's there in these scenes. Leia lives in this film in a way that is mind blowing to me"
The cast members that were able to make the trip were then brought out on stage. First, C-3PO actor Anthony Daniels made his way to the stage and was met with a very warm welcome. He talked for a minute about his character's place in the franchise (the "voice of reason," as he put it) and his gratitude for playing the part for more than four decades. No disrespect to Daniels, but Billy Dee Williams was brought on next and people have been waiting for Lando Calrissian's return for a very long time. He was given a huge reception from the crowd. The biggest moment came when Stephen Colbert asked how he managed to get back into the mindset of Lando after all these years. It was then time to bring out the new generation cast. On hand were Daisy Ridley, John Boyega, Oscar Isaac, Kelly Marie Tran, Joonas Suotamo Naomi Ackie and, of course, BB-8. It's interesting to note that Ackie was the only cast member new to this movie. She did, however, reveal her character's name, which is Jannah. We also got a first look at Jannah, which is pretty classic as the franchise goes, yet fresh, and, frankly, badass. Stephen Colbert prodded, asking whether or not she's Lando's daughter. To which Ackie played coy. "Lando is a very charming man, so he could have children all over the universe"
Blame it on J.J. Abrams being there. Blame it on the movie still being eight months away. Blame it on whatever, but the cast wasn't giving anything away. Throughout the panel, we were treated to looks at key characters in the movie in still form. None of these looks were, in their own, telling, but exciting nonetheless. (I've included an embed to my live tweet thread from the event below, which has the pics in question.) We were also introduced to a couple of new characters. An alien by the name of Klaw, a friend to the Resistance, and a new droid named D-O (D.O.? ), who is a friend of BB-8. Abrams didn't clarify the spelling, but it's pronounced "Dee Oh." One of the most interesting things discussed (or dodged, really) had to do with the relationships between Rey and Kylo, or Finn and Rose. Nobody was willing to open or close any doors firmly. But Rey did say we won't be seeing any more shirtless Kylo in Force visions. Bummer. It's also worth noting that Kelly Marie Tran got the biggest reaction from the crowd. Considering the hate she got online from trolls that force her to leave Instagram, that was nice to see. Before everyone packed up we were, naturally, treated to the movie's first teaser trailer. The title wasn't revealed at all during the panel. It wasn't until the final moment when the title card came up in the trailer that anyone knew. J.J. Abrams and Stephen Colbert teased the audience to tee things up. Then the house lights came down and everyone was silent. An overused metaphor, to be sure, but I could have heard a pin drop in my section for a brief moment. There's another time and place for a detailed trailer breakdown, but as anyone who has watched the trailer by now (I'm guessing anyone reading this has) knows, there are a ton of moments to flip out about. And flip out the crowd did. Rey backflipping over a Tie Fighter?! Leia is back! Palpatine's laugh?! And then we got the Star Wars 9 title reveal. Star Wars: The Rise of Skywalker. The crowd was so amped up I can't tell if any of it was for the title itself. Though, since this is the end of the Skywalker saga as we know it, the title does feel at least a little appropriate. When the trailer wrapped up, Ian McDiarmid, Palpatine himself, came out on stage and, in his Palpatine voice, said "roll it again." Play The Rise of Skywalker trailer again they did. Who's gonna argue with the Emperor? The crowd, again, went ballistic. And with that, the panel concluded. There will be much to discuss in the coming days. My main takeaway, being in this room, is that people are so ready to love Star Wars right now. The divisiveness that plagued The Last Jedi wasn't fun for anyone. We're all ready to have fun with this franchise again. Star Wars: The Rise of Skywalker arrives on December 20. I'll be down here keeping you all posted on the happenings from Star Wars Celebration throughout the weekend. May the Force be with you.